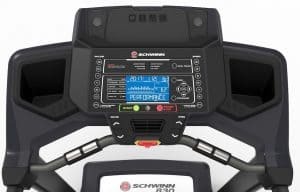 Schwinn has been consistent in the production of sports equipment and they have manufactured virtually all different kinds of sports machines that are very recommendable such as the Schwinn 830 Treadmill (2016). Are you looking forward to losing weight or staying physically fit? Schwinn 830 Treadmill will help you to achieve that in the most comfortable way possible. When you are a proud owner of this machine there is a lot you stand to achieve from its innovative features and quality. It has got a media to shelve on the console, the ability to download exercise data and it is also integrated with 22 programmed workouts just like the Schwinn 430 Elliptical Machine (2016). Very few brands have got the innovative features Schwinn has integrated into their equipment especially this one. A user can connect to Schwinn Connect and MyFitnessPal plus good warranties as well. It has got incline from 0-12% which allows the user to experience a challenging goal-oriented workout. It has got oversized crossbar tubing that ensures stability even in a rigorous workout. It has got SchwinnConnect that helps you to track your goal and export data which in turn motivates you and keeps you focused, and this is also compatible with a most popular fitness app. It has got transport wheels for easy transportation or movement. It has got a 5mm belt, which is durable. It has got 22 profile programs which include; 1 manual, 3 quick goals, 5 training, 3 intervals and 2 custom. It has got a large 3’’ x 5’’ high resolution blue backlit LCD monitor. It has got 3-speed cooling fan designed to keep the user cool at all times during the workout. It has got heart rate monitoring sensor on the hand bar grips and it is telemetry enabled also, which means the user can use a chest strap heart rate monitor. It has got SoftDrop folding system that allows the user to easily fold and put away for storage. It has got USB charging port which means a user can charge a device like a tablet or any rechargeable musical device. It has got large 2.5’’ crowned rollers for a quiet and smooth workout. 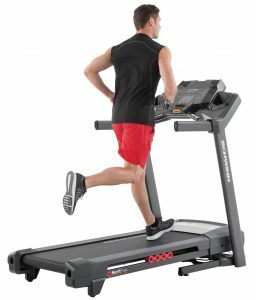 It has got a cell SoftTrack deck cushioning system designed to reduce the stress associated with working out on treadmills on the joints, such as the hips, ankles, and knees. It has got big acoustic chambered speakers for quality sound output for those that love to play music while working out. It has got quick access speed and inclines buttons which mean a user can always make changes on speed and incline on the go. It has got water bottle holders/pockets to enable the user to keep hydrated throughout the workout. It supports maximum 300 pounds user weight. Selling and shipping of this product or any other products by Schwinn are not sold or shipped directly by them but sold and shipped through Amazon and other retailers. Therefore if you are buying from Amazon, shipping is usually free especially for U.S residents but other retailers are likely to charge for shipping which can be very a significant amount. Assembly usually takes like an hour or more but it comes with an instruction manual that would work anyone through step by step on how to assemble. Schwinn is a household name in terms of sports equipment production. It was founded in 1895 and ever since the company has kept on growing and they are known for their unique production of commercial fitness equipment, recreation product, and home gym. So, Schwinn 830 Treadmill is one of their iconic productions that only a few other brands can compete with. 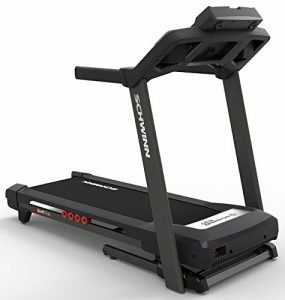 If you are contemplating on getting a treadmill for that home gym then you might have just seen the right treadmill which is the Schwinn 830 Treadmill. It has got features you can’t simply refuse features that would allow you to experience a workout of a lifetime and also achieve your goals.